We thoroughly enjoyed the experience. We would like to thank all the staff for a great weekend. When would you like to stay at YHA St Briavels Castle? YHA St Briavels Castle is a venue with real wow factor that will amaze and inspire visitors of all ages. The castle is over 800 years old, with bags of character and remarkably well-preserved features throughout, and a magical charm that promotes social interaction and historical interest in equal measure. The castle is a Grade I listed ancient monument, a rich piece of history and an inspiring location. Be transported back in time to Medieval world of King John and the Magna Carta within this Area of Outstanding Natural Beauty. There are also two spacious “dormitory” rooms – forming the tops of the two towers – which are perfect for larger groups of families and friends who are happy to share. Both rooms are available for private hire by booking direct with the hostel as these rooms are not available to book online. The social spaces of the Castle were reconfigured in 2015 to create an amazing banqueting hall fit for a king! The Castle Chapel isa comfortable family lounge; with dressing up, children’s toys and books. There is no TV at the Castle so the emphasis is really on the social occasion of making new friends, playing games together and sharing experiences. The modern world has however breached the Castle walls and there is WiFi available in the social spaces; Chapel, Banqueting Hall and Old Stables. The Old Kitchen is a quiet lounge; with wood panels, a period fireplace and fantastic historical features (including the original staircase and dog spit wheel). The Banqueting Hall (formerly King John’s Lounge) is a spacious dining room, with a grand fireplace and period features an amazing backdrop to the regular feasts held within its walls. With tapestries on the wall, the flicker of candles, a sumptuous feast, and the sounds of Minstrels making merry tunes, the hosted banquet is a wonderful social experience that both entertains and informs guests. Forget your knife and fork and “Rules of Mum”, it is eating with fingers and banging the table with raucous delight that take precedence here. The Old Stables is a versatile social space; with service of breakfast and supper club for families, a classroom/meeting room for groups, daytime café, banquet craft zone, and relaxing social space in the evenings. The grounds are an archaeologically preserved site and operate as an English Heritage visitor attractions during the afternoon regrettably no camping is permitted at St Briavels Castle. There is a peaceful walled garden and courtyard area, to soak in the culture and watch the flights of fledgling archers as they practice this noble sport within this magical setting. This is also the venue throughout the year for amazing historical and literary themed events, such as “Shakespeare At The Castle” at the end of July, a WW2 weekend in April and the “Heritage Open Weekend” on the second weekend of September. The acoustics in the grounds are fantastic for live music events and plays, and are open as a community resource for local schools and youth groups. At YHA we pride ourselves on delivering a broad selection of delicious food at affordable prices, alongside a range of freshly made hot drinks and a well-stocked bar. Let us welcome you to rest your legs and indulge your senses after the day’s adventure. Choose from our tasty daily specials or delve into our café-bar style menu experience, think scrumptious bar snacks, trendy English tapas, grilled paninis and loaded stone-baked pizzas. Don’t forget, kids under 10 eat free – get one kid’s meal free with every adult’s meal. Energise your outdoor adventure with a nutritious packed picnic lunch. Prepared for you on request, our delicious packed lunches include a sandwich with a selection of fillings to choose from, a chocolate bar, a bottle of still mineral water, a packet of crisps and a piece of fresh fruit. The hostel is right in the middle Forest of Dean and the Wye Valley so there's lots of fantastic walks from the doorstep. Hop on your bike and explore the Forest of Dean. Try the Royal Forest Route which takes in a sculpture trail, mines dating back to the 1820's and a virtual lagoon of bluebells in spring! Visit the atmospheric mine workings with nine impressive caverns and winding passageways - great whatever the weather. Largest Wetland centre in the UK, with new flamingos and amazing other natural birds in a great surrounding. Explore this unique and enchanting place, with meandering pathways and fantastic rock formations that inspired JRR Tolkien. Exciting adventure in the forest - try Inspire2Adventure's Guided Open Canoe Expeditions, Gorge Scrambling Experience, Rock climbing and Abseiling and more! So much to see! local craft workshops, events and shops to inspire your creativity. Throw your own pot or visit the garden retreat. This local gallery showcases original paintings, prints, ceramics and jewellery by D. Mariana Robinson. Art tuition available. Goodrich Castle is one of the finest and best preserved of all English medieval castles. We are excited to announce the return of the Sevenoaks Shakespeare Society to YHA St Briavels Castle in July 2018. Towels and toiletries: Towels and toiletries are not provided but are available to hire or purchase from reception. Bedding is supplied. Parking: There is parking available for guests outside the hostel. Open every day? 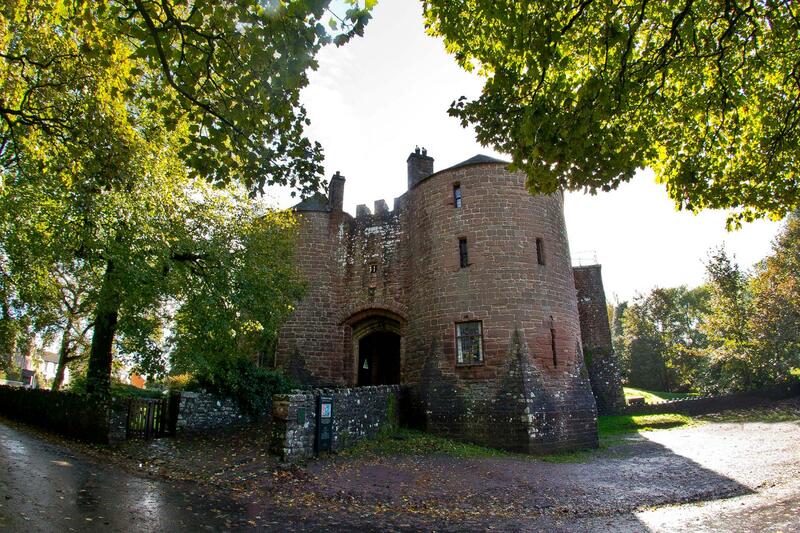 : YHA St Briavels Castle is open all year round for group bookings. Beds and rooms for families and individual travellers are released three months in advance so please check the website for availability. Breakfast: Breakfast is served from 7.30am until 9am. YHA St Briavels Castle provides great opportunities for English and History students with various educational packages available. The hostel has beds for up to 66 people, classroom facilities and meals provided. We run fantastically rewarding History, PE & Geography Packages that help children to “Learn Outside the Classroom” (and are LOTC accredited). Visit the YHA School Trips website for more information. The Castle dates back to the 12th Century, and many a tale from this world and the next can be found across the Internet. As an introduction why not take a Virtual Tour, but there really is no substitute for the real thing, and joining one of our regular Castle Tours where you can become a history detective and help uncover the secrets of the past. As King John’s former hunting lodge we are uniquely placed to offer this within a living reminder of the King and one of the most important pieces of history to shape our society today. You enter this remarkable and unique YHA site through a triple portcullis gatehouse into a secluded courtyard and walled garden, and then enter through the grand wooden period door into the West Tower to a warm welcome fit for a King or Queen. Take a walk through time within this former hunting lodge of King John from the 13th century, spend a peaceful moment in his Chapel, rest your feet in his bed-chamber, and wonder who spent time in the debtors prison and met their grizzly end on the Castle gallow. All bedrooms are full of character with amazingly well-preserved Castle features, original stone walls & features from the Medieval to Victorian period (when the Castle was extensively renovated as a family home). However, they are basic (bunk beds/storage only). The only exception is Isobel’s which does have sinks and a double bed, with single over. There are no en-suites and some rooms are quite a walk from washroom facilities and up steep, narrow staircases – the Grade 1 listed nature of this site does not permit modernisation to facilitate demands for smaller rooms/en-suites. The compromise in facilities however is more than made up for with the opportunity to step back in time and imagine yourself a travelling lord or lady staying as the guest of a Medieval Sheriff, joining his household for a feast and rest on your journey of discovery through the Royal Forest of Dean. A smaller, quiet social area is set up in the Old Kitchen under the remains of the “Turn Spit Wheel” – a marvellous old feature that would have turned the Wild Boar on the spit over the kitchen fire, powered by a small dog. My name is Linda Harrison and I have the privilege of being the latest custodian of St Briavels Castle, just one character to reside within the lifetime of the Castle but hopefully adding in a small way to the rich legacy of this remarkably well-preserved and awe-inspiring site. It truly is a pleasure to come to work every day, to step within the Castle walls and share its secrets and fascinating story. My background is history and archaeology so the Castle and I are a match made in Heaven, and I enjoy to continue to discover and share its hidden past. Working for the YHA for over 10 years, I have been privileged to spend time in fabulous locations (including the Lake District, Yorkshire Dales and Devon), sharing customer experiences and journeys, and developing new skills and interests along the way, including, since my arrival in the Forest of Dean, richly rewarding school activity packages & YHA Summer Camps. There are plenty of family fun attractions and outdoor activities; wooded walks, cycle trails, canoe routes, world-famous rock climbing and views at Symonds Yat, watch the Severn Bore, and visit even more castles! You are in the middle of the Forest of Dean and close to the Brecon Beacons, or if you are looking for a city break for the day Gloucester, Bristol and Cardiff are all within easy reach.